ALBANY, N.Y. (CN) – Spelling trouble for the continued operation of a nuclear-power plant in New York City’s backyard, the state’s highest court held Monday that the application to renew Indian Point’s federal license is not exempt from state review. 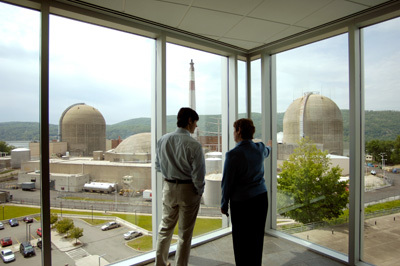 Entergy Nuclear Operations owns the two pressurized-water reactors at Indian Point, located along the Hudson River near Peekskill, just 40 miles north of New York City. Together they supply about 25 percent of the power used in the city and Westchester County. When both plants were nearing the end of their 40-year operating licenses in 2007, Entergy applied to the Nuclear Regulatory Commission for 20-year license renewals. Facing opposition from New York, however, Entergy sued in 2013 to have a judge rule that the state’s approval – in the form of a Coastal Zone Management certificate – was not required. New York’s highest court took up the case after an appellate panel sided with Entergy in 2014, finding that Indian Point is exempt from state review. The Court of Appeals was unanimous Monday in ruling for the state. “In sum, the Department of State’s interpretation of the exemptions in the Coastal Management Program, and its conclusion that Entergy’s application to re-license the nuclear reactors at Indian Point is subject to consistency review are rational, and must be sustained,” Judge Sheila Abdus-Salaam wrote for the court. Jerry Nappi, a spokesman for Entergy, said the company is reviewing the court’s decision to determine its next steps. While awaiting a final supplemental environmental impact statement from the NRC, Entergy had withdrawn the Coastal Zone Management application it filed with New York. Entergy could refile that application now. Nappi expressed optimism that this hurdle will not hurt Entergy’s permit chances. “The facility continues to safely operate in a manner that is fully protective of the Hudson River and in compliance with state and federal law,” Nappi said. Despite the plant owner’s optimism, New York Gov. Andrew Cuomo has intensified his calls to close the facility in the wake of a May 9, 2015, fire at the plant that caused fluid to spill into the Hudson River. “Indian Point is antiquated and does not belong on the Hudson River in close proximity to New York City, where it poses a threat not only to the coastal resources and uses of the river, but to millions of New Yorkers living and working in the surrounding community,” Cuomo said in a statement. The D.C. Circuit meanwhile is weighing claims from environmentalists concerned about the plant. Regulators have downplayed the alarm, however, saying there is no reason to suspend the plant’s license. “Petitioners’ framing of their petition here as an ’emergency’ simply invites the court, inappropriately, to substitute its judgment about nuclear safety for the NRC’s technical expertise,” a response brief from the Nuclear Regulatory Commission said.